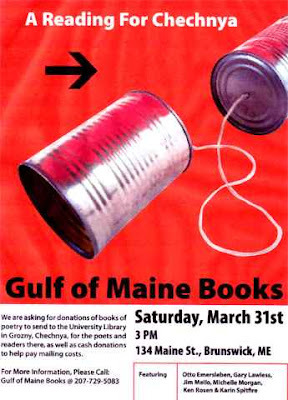 On March 31, 2007, Gulf of Maine Books (an independent alternative bookstore founded in 1979 by Beth Leonard and Gary Lawless) hosted a reading to benefit the University Library in Grozny, Chechnya. The military campaigns of 1994-95 were a catastrophe for Chechnya’s libraries. By the spring of 1995, only eight of Grozny’s original thirty city libraries were left intact. All of the major libraries had been destroyed, including the National Library, the National Children’s Library, the National Medical Library, the Central Scientific Library, all three university libraries, and all of the research libraries.